Molly Norris is Hiding… and so are you. Molly Norris of Seattle is in hiding. Why should you care, you ask? Allow me to incite you to concern. 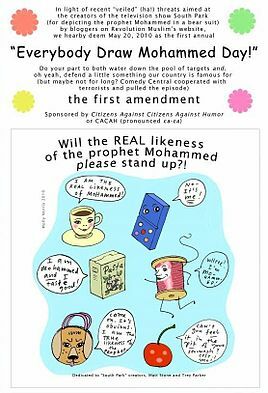 Molly drew a cartoon deeming May 20, 2010 the first annual “Everybody Draw Mohammed Day.” Her poster offends some Muslims. She is in hiding because she is receiving death threats from some Offended Muslims Supporting Violence As A Response (OMSVAARs). I must set up this clumsy acronym because I hold out hope that a violent, retaliatory ideal is not held by ALL Muslims, and thus only an OMSVAAR will take offense at the acronym. This should also put to lie any cries of “Islamophobe!”… No, I am an open OMSVAARophobe. OMSVAARs feel that violence in “defense” of Islam, or in response to “offense,” is an appropriate reaction to another human’s free expression. OMSVAARs believe Islam must be physically, violently protected from pictures, words, and dissenting opinion. Molly is in hiding because history has shown us two things: OMSVAARs are serious, and secondly, recent events show that Western societies will not defend the right of Free Speech…either by protesting incursions at the UN, or by prosecuting OMSVAARian incitement to violence or death threats over “offensive” words. She needs our help. A little history lesson first: Her poster protested Comedy Central’s decision to pull an episode of South Park because…wait for it… some OMSVAARs threatened violence because they claimed the images and ideas portrayed offended them. South Park creators Trey Parker and Matt Stone produced their two “Mohammed” episodes (including a censored or disguised “Mohammed”) in reaction to OMSVAARian rage aimed at Kurt Westergaard, who drew a cartoon in 2005 and has been under death threat and police protection since. Segments of the Muslim world rioted over Westergaard’s cartoon. There was violence worldwide, 139 people were killed, and there was a loud and consistent call for violence against Westergaard and the other cartoonists. Virtually every Western media outlet bowed to the OMSVAAR threat, and would not publish the cartoons. Comedy Central’s response to South Park continues this ignoble and cowardly response to OMSVAAR threats. (“OMSVAAR” is growing on me, especially in support of Westergaard… what with the Danish sound and double “A”). I could continue the recitation of this ancestral list of Molly Norris’ OMSVAARian fatwa, but I hope the point is made: The threats to Molly are not new or isolated. Where was I?….Oh yes: Molly Norris is in hiding and you should care, because her story is microcosm of a concerted global push by OMSVAAR’s to enshrine…either by law or by fear… their perversely asserted “right” to violently respond to whatever they claim offends them. It is no less than a push to end Free Speech. Our response will make all the difference in the world. While we wait, and try to educate the entire Muslim world to value Free Speech as we do, OMSVAARs advance against our tepid non-response. I can no longer silently, anonymously, hold my breath waiting for someone else to help Molly. I must stand. The only way we can truly help Molly and demonstrate how much we value Free Speech is to individually, and as a Society, defend it from threats and violent actions. • Molly, and our First Amendment rights need the help of people like you and me, refusing to allow “offense” to be justification for violence. I stood with her on May 20 and I stand with her now. Join me! • Molly needs law enforcement to actively prosecute incitement to violence, and not defer to the OMSVAAR’s assertions that expressing a differing opinion is, in itself, incitement to violence. Placing death threats and bounties on people must not be protected by religious immunity. Take local cases to authorities and visibly show resistance! • Molly needs people like President Barack Obama, and every other world leader, to stand in defense of Free Speech with as much vigor as OMSVAARs stand in defense of their “right” to threaten to kill you for speaking. Advocate with your representatives, so they will stand and leverage their positions for good! • Most importantly, Molly and all of us need ordinary, “run-o-the-mill” Muslims to stand up in defense of Free Speech and say, “I am offended at your actions; I disagree with your opinions, but I am even more enraged by my partners in faith who incite violence or threaten you with death. We will not tolerate such abuses of free expression, especially in the name of Islam.” Any takers? Take what action you have available to you. Stand with me. We must join in solidarity against intolerant people who threaten or commit violence in the name of defending their faith… from ideas, words, dissent, opinions and pictures. Molly Norris is in hiding. As long as she is, so is Free Speech… and so are you. This entry was posted in First Amendment, Islam. Bookmark the permalink.